Before modern grab-and-go grocery stores, Americans shopped at general stores, where clerks measured their liquid or dry goods by hand. In the American colonies, standardized measurements that determined the exact capacity of a gallon or pint were inherited in part from England. This assembled set of seven pewter measures was likely used for the sale of liquid goods such as wine, cider, beer, milk, or medicine. From largest to smallest, the group includes both familiar and unfamiliar measurements: gallon, half-gallon, quart, pint, half-pint, gil, and half-gil (pronounced jill). 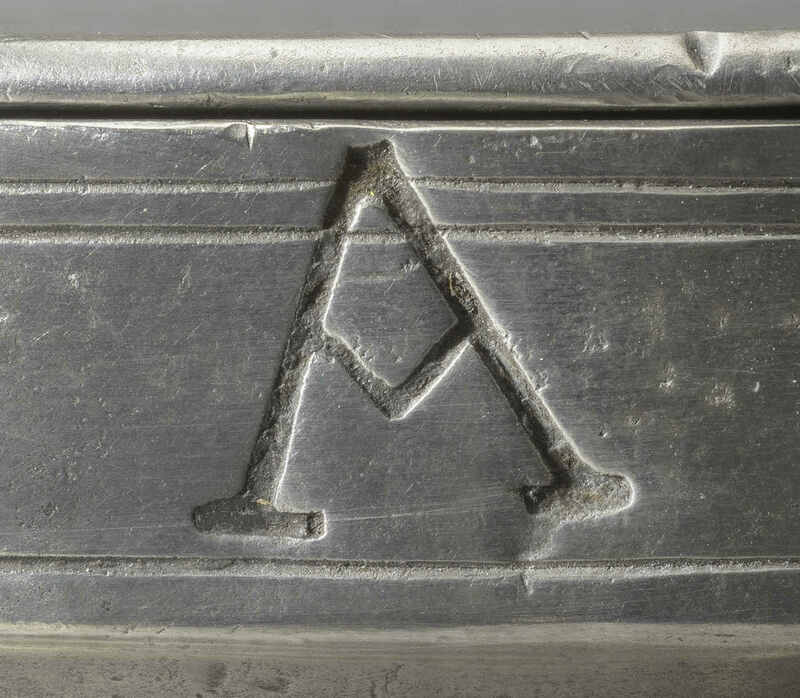 The “A” mark on the containers indicates that they met the “assize,” or standard measurements, used in New York State. New laws passed in 1804 eliminated the use of pewter for making measures, turning instead to more reliable iron, brass, or copper. This pewter set therefore represents the young United States on the cusp of outgrowing its British imperial roots. Image above: Set of assembled pewter liquid measures (Gallon, half-gallon, and pint measures probably made by Henry Will). New York, New York; before 1804. Museum purchase with funds drawn from the Centenary Fund and partial gift of David M. Kilroy and Melodee Wagen in memory of John Carl Thomas 2016.31.1-.7. Advertisement. From Loudon’s New-York Packet, August 3, 1786. The gallon, half-gallon, and pint measures were likely made by Henry Will, a prominent New York City pewterer in the late 1700s. 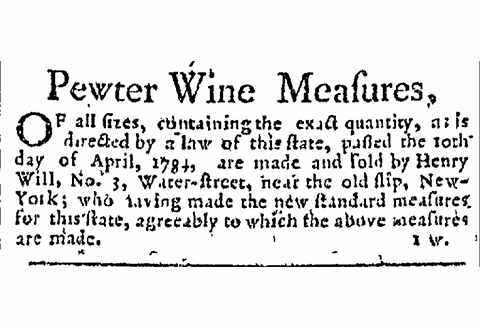 As his 1786 advertisement shows, that year Will created a new set of standard measures from which all others in New York State were produced―a very important task. He earned this commission after a public scandal resulted in an investigation by city officials, revealing that the previous set of measures did not conform to customary New York sizes. These liquid measures are closely related to other Winterthur items. 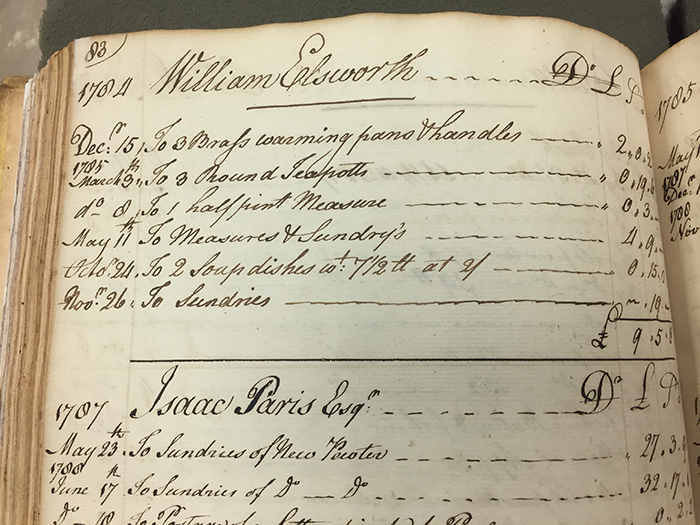 Henry Will’s ledger book is housed in the Winterthur Library and records numerous purchases for pewter measures of all sizes. This new group, assembled over many years, joins copper and brass liquid and dry measures in the collection.